Mrs. R., age 72, was referred because of intermittent hemorrhagic otorrhea and pulsatile tinnitus in the right ear. She also reports having daily headaches and hearing loss in her right ear. On examination, she had right tongue atrophy and rightward deviation of her tongue with protrusion. Her brain MRI results showed a large predominantly extracranial right skull base enhancing lesion exiting the jugular foramen (Figure 1). Considering Mrs. R’s presenting symptoms of pulsatile tinnitus and hemorrhagic discharge from the ear, a catheter angiogram was performed and revealed hypervascularity suggestive of a glomus tumor (Figure 2). Partial embolization was performed to reduce blood flow into the lesion and palliate her otorrhea. Figure 1. Coronal (A) and axial (B) MRI shows an avidly enhancing glomus jugulare tumor. It extends superiorly within the right cerebellopontine angle and extends through the jugular foramen into the extracranial jugular fossa. Figure 2. AP (A) and lateral (B) external carotid arteriogram demonstrate hypervascularity of the glomus jugulare tumor with extensive tumor blush apparent. Partial embolization was performed to palliate intermittent hemorrhagic otorrhea. Given Mrs. R’s advanced age, a decision was made not to proceed with surgical resection. Instead, definitive lesion management using fractionated radiotherapy was elected. Head and neck paragangliomas (PGLs) are highly invasive, slow-growing (0.8-2 mm/year typically), and hypervascular neoplasms composed of glomus cells. Small and large PGLs grow relatively more slowly than those of intermediate size.1-6 Incidence is 2 to 3 times higher in women and PGLs typically occur in the 5th or 6th decade of life, although pediatric (age 12) and late-life (age 78) occurrences have been reported. Glomus cells are peripheral chemoreceptors that rapidly equilibrate pH, pO2, and pCO2 at the carotid body to maintain homeostasis. Tumorigenesis that disrupts paragangliar cell architecture disrupts homeostasis. These tumors account for just 0.6% of all head and neck tumors and are termed chemoductoma, nonchromaffin PGL, and most commonly, glomus tumors. Glomus cells are derived from neuroectodermal crest cells that travel along the parasympathetic ganglionic tract during the embryonic period, which explains the diverse anatomic sites of glomus tumors (Box). 3. anteriorly within the neck, displacing the ICA. Jugular Fossa. Jugular fossa PGLs may extend intra- and extracranially at or beyond the jugular fossa14 and penetrate the temporal bone and skull base via neurovascular foramina (paths of minimum resistance, multidirectionally). Intracranial tumor invasion may occur via the petrous bone and tumors may advance into the internal auditory canal or infralabyrinthine extension and localize within the jugular vein or along the internal tympanic wall. Intraluminal spread of the jugular vein into the IJV, sigmoid sinus, and inferior petrosal sinus or inferior extension into the infratemporal fossa (ITF) and poststyloid parapharyngeal space indicate paraganglioma encroachment of the jugular fossa.4 Intracranial extension of PGLs can also occur along the facial nerve, in the nose and nasopharynx, the trachea, and optic chiasm and may15 obstruct venous flow via vascular invasion. Clinical presentations of head and neck PGLs are diverse, and this pathology has thus been referred to as “a great masquerader.” Nonuniform presentation results from the complex anatomy within the neck and skull base with variable physical, hemodynamic, and metabolic microenvironments. Many patients with head and neck PGL remain asymptomatic because the tumor is often nonfunctional, has low proliferation rates, and resulting mass effect that can be well tolerated. Jugular foramen PGLs present with symptoms of deficits in lower CNs (CN IX, X, XI, and XII). A palsy of the lower CNs termed Collet-Sicard syndrome may occur in 10% of jugular foramen PGLs.16 Sensorineural hearing loss and pulsatile tinnitus are reported most frequently. Tympanic PGLs usually present as proliferating unilateral pulsing tumor bodies at or behind the level of the eardrum. Interestingly a bluish tone is sometimes described on direct observation.11 Like jugular foramen PGLs, tympanic PGLs often cause symptomatic pulsatile tinnitus and conductive hearing loss. When head and neck PGLs are suspected, diagnostic testing should include serum and urine tests for catecholamine metabolites including metanephrines and urinary vanillylmandelic acid (VMA).3,19,20 Results of these tests guide pharmacologic therapy and may be helpful in management of any associated hypertension. Head and neck PGLs can be imaged with Doppler duplex ultrasound, CT, or MRI. Erosion at the involved skull base foramina and within the temporal bone may be apparent on CT. Intratumoral flow voids producing a characteristic salt-and-pepper appearance are commonly seen on MRI. Perfusion imaging with CT, MR, or single-photon emission CT (SPECT) may provide additional information regarding vascularity. Functional imaging with PET, conventional scintigraphy, and otreotide scan have also been utilized. 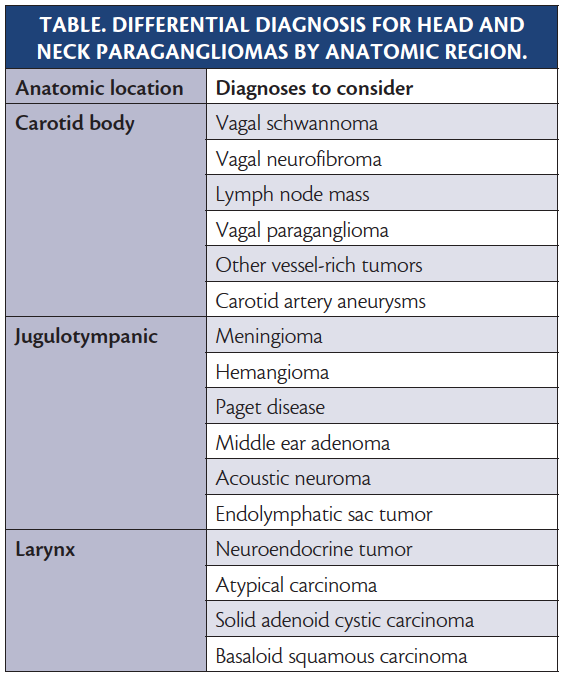 Interestingly, 25% to 30% of head and neck PGLs are found incidentally.21-23 The differential diagnosis for PGL is broad and varies with location (Table). Because PGLs are typically benign, slow growing, and invasiveness there are a number of management options for PGL ranging from conservative to maximally invasive. Preoperative Embolization. Endovascular embolization is used preoperatively for selective occlusion of arterial feeders to the tumor. Presurgical embolization attempts to devascularize the tumor mass such that intraoperative blood loss is minimized and visualization of surgical planes are optimized. Radionuclide Therapy. Peptide receptor radionuclide therapy (PRRT) has been advocated since the 1980s for the management of metastatic head and neck PGL. Radiographic response rates of up to 43% have been seen in patients undergoing palliative treatment with PRRT used in conjunction with functional [131I]-meta-iodo-benzyl-guanidine ([131I]-MIBG) imaging.28I]-MIBG)> Neuroendocrine tumor cells (NETs) are targeted using PRRT coupled with radiolabeled chelating agent DOTATATE containing β-emitting isotopes.29 Peptides bind to somatostatin receptors (SSTRs) on NET cellular membranes, specifically SSTR-2. 1. Yuan Y, Shi H, Tao X. Head and neck paragangliomas: diffusion weighted and dynamic contrast enhanced magnetic resonance imaging characteristics. BMC Med Imaging. 2016;16:12. 2. Cama A, Verginelli F, Lotti LV, et al. Integrative genetic, epigenetic and pathological analysis of paraganglioma reveals complex dysregulation of NOTCH signaling. Acta Neuropathol. 2013;126(4):575-594. 3. Taieb D, Pacak K. New insights into the nuclear imaging phenotypes of cluster 1 pheochromocytoma and paraganglioma. Trends Endocrinol Metab. 2017;28(11):807-817. 4. Persky M, Tran T. Acquired vascular tumors of the head and neck. Otolaryngol Clin North Am. 2018;51(1):255-274. 5. Jansen JC, van den Berg R, Kuiper A, et al. Estimation of growth rate in patients with head and neck paragangliomas influences the treatment proposal. Cancer. 2000;88(12):2811-2816. 6. Carlson ML, Sweeney AD, Wanna GB, Netterville JL, Haynes DS. Natural history of glomus jugulare: a review of 16 tumors managed with primary observation. Otolaryngol Head Neck Surg. 2015;152(1):98-105. 7. Moore MG, Netterville JL, Mendenhall WM, Isaacson B, Nussenbaum B. Head and neck paragangliomas: an update on evaluation and management. Otolaryngol Head Neck Surg. 2016;154(4):597-605. 8. Marchetti M, Pinzi V, Tramacere I, et al. Radiosurgery for paragangliomas of the head and neck: another step for the validation of a treatment paradigm. World Neurosurg. 2017;98:281-287. 9. Papaspyrou K, Mewes T, Rossmann H, et al. Head and neck paragangliomas: report of 175 patients (1989-2010). Head Neck. 2012;34(5):632-637. 10. Williams MD. Paragangliomas of the head and neck: an overview from diagnosis to genetics. Head Neck Pathol. 2017;11(3):278-287. 11. Woolen S, Gemmete JJ. Paragangliomas of the head and neck. Neuroimaging Clin N Am. 2016;26(2):259-278. 12. Dorobisz K, Dorobisz T, Temporale H, et al. Diagnostic and therapeutic difficulties in carotid body paragangliomas, based on clinical experience and a review of the literature. Adv Clin Exp Med. 2016;25(6):1173-1177. 13. Miller RB, Boon MS, Atkins JP, Lowry LD. Vagal paraganglioma: the Jefferson experience. Otolaryngol Head Neck Surg. 2000;122(4):482-487. 14. Samii M, Alimohamadi M, Gerganov V. Endoscope-assisted retrosigmoid infralabyrinthine approach to jugular foramen tumors. J Neurosurg. 2016;124(4):1061-1067. 15. Rosenwasser H. Glomus jugulare tumors. Long-term tumors. Arch Otolaryngol.1969;89(1):160-166. 16. Smith JD, Harvey RN, Darr OA, et al. Head and neck paragangliomas: a two-decade institutional experience and algorithm for management. Laryngoscope Investig Otolaryngol. 2017;2(6):380-389. 17. Ladzinski P, Majchrzak H, Kaspera W, et al. Early and long-term results of the treatment of jugular paragangliomas using different ranges of surgical approach. Neurol Neurochir Pol. 2011;45(3):213-225. 18. Lupsan N, Resiga L, Boşca AB, et al. Diagnostic reevaluation of 17 cases of pheochromocytoma - a retrospective study. J Morphol Embryol. 2016;57(2 Suppl):651-661. 19. Kiernan CM, Solorzano CC. Pheochromocytoma and paraganglioma: diagnosis, genetics, and treatment. Surg Oncol Clin N Am. 2016;25(1):119-138. 20. Groot M, Boxer LM, Thiel G. Nerve growth factor- and epidermal growth factor-regulated gene transcription in PC12 pheochromocytoma and INS-1 insulinoma cells. Eur J Cell Biol. 2000;79(12):924-935. 21. Benn DE, Robinson BG, Clifton-Bligh RJ. 15 years of paraganglioma: clinical manifestations of paraganglioma syndromes types 1-5. Endocr Relat Cancer. 2015;22(4): T91-103. 22. Plouin PF, Gimenez-Roqueplo AP. Pheochromocytomas and secreting paragangliomas. Orphanet J Rare Dis. 2006;1:49. 23. Amar L, Servais A, Gimenez-Roqueplo AP, et al. Year of diagnosis, features at presentation, and risk of recurrence in patients with pheochromocytoma or secreting paraganglioma. J Clin Endocrinol Metab. 2005;90(4):2110-2116. 24. Lenders JW, Duh QY, Eisenhofer G, et al. Pheochromocytoma and paraganglioma: an endocrine society clinical practice guideline. J Clin Endocrinol Metab. 2014;99(6):1915-1942. 25. Wing LA, Conaglen JV, Meyer-Rochow GY, Elston MS. Paraganglioma in pregnancy: a case series and review of the literature. J Clin Endocrinol Metab. 2015;100(8):3202-3209. 26. Ivan ME, Sughrue ME, Clark AJ, et al. A meta-analysis of tumor control rates and treatment-related morbidity for patients with glomus jugulare tumors. J Neurosurg. 2011;114(5):1299-1305. 27. El Majdoub F, Hunsche S, Igressa A, et al., Stereotactic LINAC-radiosurgery for glomus jugulare tumors: a long-term follow-up of 27 patients. PLoS One. 2015;10(6):e0129057. 28. Chrisoulidou A, Kaltsas G, Ilias I, Grossman AB. The diagnosis and management of malignant phaeochromocytoma and paraganglioma. Endocr Relat Cancer. 2007;14(3):569-585. 29. Pinato DJ, Black JR, Ramaswami R, et al. Peptide receptor radionuclide therapy for metastatic paragangliomas. Med Oncol. 2016;33(5):47. 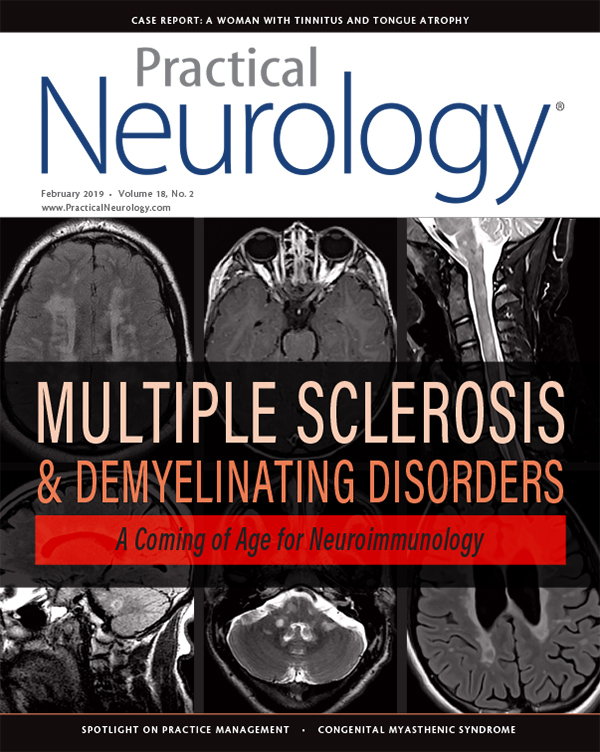 The borderline of neuromyelitis optica and systemic lupus erythematosus.